I've added Nexus repository indices for the FUSE Maven repositories. You can find instructions on how to add these to your m2eclipse installation here. Some folks have been having issues getting all the Maven repositories set up properly in Nexus for Apache Camel. Here's my working Nexus config and settings.xml - hope it helps! 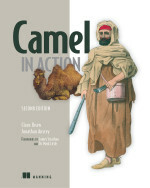 I'm an Apache Camel committer! Over the past few months I've been hacking away on various parts of Apache Camel. It was initially just for fun, but quickly turned into my day job :) With over 40 fixes contributed, the Camel team decided to vote me in as a committer! This is my first committer status on any Apache project so its pretty exciting. I've traditionally been involved with closed source projects only. Looking forward to more Camel hacking! BTW for those who are interesting in contributing to the growing Camel project, Jamie posted a good guide to Apache process here.